The Lotus type 98T was the last of the famous JPS cars produced at Ketteringham Hall. Driven by Ayrton Senna and Johnny Dumfrees it achieved significant success particularly in qualifying. The last of the unrestricted turbos the car was powered by the trail blazing Renault V6 engine in it's final EF15 configuration. With race power rated at just above 1000bhp and qualifying power estimated to exceed 1300bhp the engine proved remarkably drivable but suffered from a lack of fuel efficiency during the early part of the season. The car features several novel systems including driver adjustable ride height and water injection. Chassis 04 was the last Lotus to be painted in JPS colours and was driven in the second half of the 1986 season by Ayrton Senna. It started from pole position on four occasions and achieved several podium finishes. The Lotus formed a part of Sky F1's celebration of the life of Ayrton Senna. Martin Brundle, Damon Hill and Bruno Senna drove the car throughout the day and enjoyed it enormously. 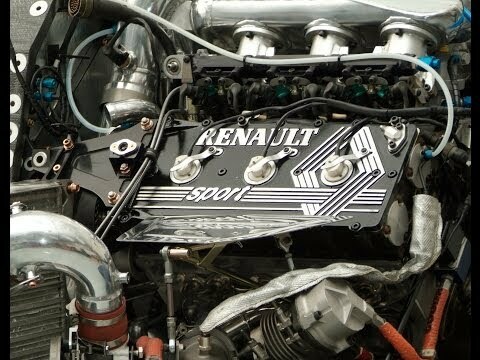 After a gap of 3 years the Renault EF15 engine finally burst back into life. There was a lot to think about so we filmed this just on a simple camera. The engine fired straight away and sounded and smelled just as it should. We will be shaking the car down in the next week or so and all being well it will be at the Goodwood Festival of Speed. After months of being up in the air the 98T is now firmly on the ground. It's always a strange thing to see how low these cars are after they have been at waste height for so long. The engine installation is now complete and a few other jobs done. All the wishbones, uprights and a few other safety critical parts have been crack-tested, x-rayed and re-painted. The engine has been preheated and turned by hand. Both car batteries have been replaced and the ECU powered up - all the cars systems seem to be working as expected. Later this afternoon we will lower the car to the ground and begin preparations for the first fire-up planned to take place tomorrow. The final part of the 98T rebuild is to install the wishbones and uprights. The engine is now fitted with the intercoolers and other ancillary parts such as the plenum chambers. The V6 is now pretty close to being mounted to the chassis.